The people of Montagu deserve a huge round of applause for their incredible support at a recent Fund raising event held to support Aviwe and Mthuthuzeli November. These two young men are halfway through a three year course at the Cape Academy of Performing Arts. 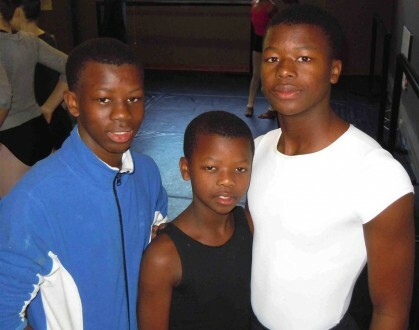 The Phyllis Spira Trust supports talented Dance for All students who gain bursaries but due to limited funds we needed to make additional costs to see the guys through to the end of the year. Saturday 14 July may have been a freezingly cold night across South Africa, but inside the Montagu Primary School Hall, the heat was on. Ballerina�s and Hip hop dancers from the surrounding communities were joined by super models (aged between 4 and 7) exhibiting a new Summer Collection by local designer Shelley von Tonder. What an encouragement to see the two young men taking hold of an opportunity and quite literally flying with it! The grace and strength of their dancing wowed us all�. It is so exciting to share in the growth and development of these two young artists. Everyone who was at the evening would agree that it is indeed a privilege to support Aviwe and Mthuthuzeli who danced brilliantly. Montagu is right behind you�.. We will continue to believe in you and help you reach your goals�keep making us proud!